Description: Females of this species are the largest of our butterflies, females often reach a whopping 10 inches across. 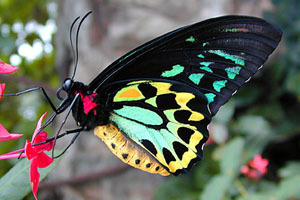 Males are a bright blue green, yellow and black on the underside, and striking metallic green and black on the upper surface. Females are more somber with black and cream markings. They feed on the vine Aristolochia tagala which is full of toxins the butterflies store for their own defense. They are good fliers and often perch at eye level in the flight house.